Budapest is considered by many visitors to be the "Paris of the East" because of its particular charm; it is the most densely populated and culturally the most important metropolis of Eastern Central Europe. From the Chain Bridge one of the most pleasant walks is south along the embankment (korzó) towards the Vigadó Concert Hall, one of the best examples of Romantic architecture and a venue for grand balls and concerts since 1865. Great figures from the world of music such as Liszt and Brahms played here, while Mahler, Dvořák, Richard Strauss, Stravinsky and Ravel all conducted. On the shore of City Park Lake stands Vajdahunyad Castle. 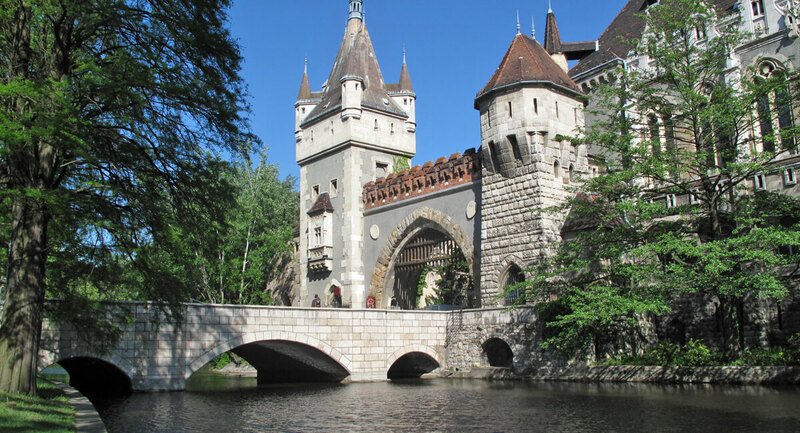 The first version of this was a wooden edifice constructed for the 1896 Millennium celebrations to a mix of designs in order to show characteristic elements of architectural styles from different parts of Hungary. This giant “model” was so successful that after it was taken down it was rebuilt out of stone. It later became home to the Agricultural Museum, which also contains one of the world’s largest trophy collections. Just like Paris, Budapest is proud of two of its old, iron framed railway stations: the Eastern Station (Keleti), and the Western (Nyugati) built in 1877. The latter is one of the most striking buildings along the Great Boulevard, and has a connection with Paris and the Eiffel Tower. The tender to build the Western Station was won by the Eiffel Company, and much of the ironwork was cast in Paris. It’s only a short walk from the Western Station to Budapest’s largest church, the 8,500 capacity Saint Stephen’s Basilica. With its principal façade facing towards the Danube, the proximity of the river necessitated digging extremely deep foundations; indeed the three levels of cellars go almost as deep as the height of the imposing church. The ground plan is in the form of a Greek cross, and the Basilica was consecrated in 1905. The right-hand tower houses Hungary’s heaviest bell, weighing in at nine tons, while Hungarian Christianity’s most important relic – the mummified right hand of the founder of the Hungarian State and Church, King Saint Stephen – can be seen in the chapel behind the sanctum. A short walk along the Inner Ring Road brings you to Dohány utca and Europe’s largest working synagogue. The first Jewish merchants settled in Buda in the middle of the thirteenth century. In the eighteenth century a Jewish community, along with craftshops and workshops, was established in Óbuda. A gradual migration into Pest started a few years later and in the mid-nineteenth century the period’s largest synagogue was built to a Romantic-Moorish design on the edge of the new Jewish quarter. It can seat three thousand people, and features cast iron columns and arches which at the time of its construction were very much a new innovation. Concerts are regularly held in the Synagogue, and the adjacent building houses the world renowned National Jewish Museum. This covers the history of Hungarian Jewry, has displays of ritual artefacts and everyday objects, and commemorates the Holocaust. There are kosher shops and restaurants in the neighbourhood. One of the most beautiful buildings on the Inner Ring Road is the neo-classical Hungarian National Museum dating from 1846. Its comprehensive displays richly illustrate the history of Hungary from its original founding onwards, and also include exhibitions of Roman, medićval and modern stonework. The building itself is regarded as a symbol of national independence, as it was the scene of pivotal events in the 1848 Revolution. The Revolution is now marked annually by the 15th March national holiday, when there are also commemorative events held at the museum. Budapest’s City Park is reputed to have been the world’s first public park open to all. In 1808 the Emperor ordered a Hungarian “National Garden” to be laid out, including the planting of seven thousand trees. Today’s City Park contains amusement areas, sports grounds, foot and cycle paths, as well as the hundred-year old Széchenyi Thermal Baths (Pest’s first), popular for swimming, relaxation and treatments. There is also the Transport Museum, containing rare model locomotives, the Petőfi Hall, home to rock concerts, and at weekends one of the city’s most interesting flea markets, where goods on sale range from interesting old books and antique painted plates to valuable old toys. In summer there is boating on City Park Lake. In winter, it is transformed into Central Europe’s largest artificial skating rink. Two buildings that dominate the southern stretch of the Danube embankment on the Pest side are the one-time Customs House built in the 1870’s (now the Economics University) and, behind it, the capital’s largest covered market. When first opened in the 1890’s a network of tunnels enabled incoming barges to unload their goods directly under the market floor. Today the Market Hall houses the city’s biggest, best and richest selection of merchandise, including everything from fresh vegetables to meat and spices. It has several times appeared in world news broadcasts, as it is a favourite place for celebrity guests to be filmed buying garlic or red paprika pepper. The City Centre’s most popular pedestrianised street, Váci utca, begins opposite the Market Hall. This was a favourite place for the well-to-do to promenade as early as the eighteenth century, and has always attracted better quality shops, now as much as then. Today virtually every world-ranking brand of cosmetics, clothes or shoes can be found in the businesses housed on the ground floors of the hundred year-old buildings. Váci utca finishes in Vörösmarty Square, dominated on one side by Gerbeaud, one of Pest’s most refined coffee houses. Budapest Zoo is a pleasant day out for all the family. It first opened in 1866 and has in the last decade undergone significant modernisation. Some of its buildings are particularly fine examples of Hungarian art nouveau. Five hundred types of animal and 4,000 different plants live within its 250 acres. The animal petting area is especially popular with children – they can come into close contact with and feed the goats, small cows and sheep. Spectacles and curios were already being paraded in the City Park in the middle of the nineteenth century, and travelling circuses regularly set up their big top here. Budapest’s own permanent circus settled here in 1891. The adjacent Fun Fair is a real meeting of antique and state of the art technology. There are gentle rides on the Ferris wheels and, for the brave, there are fast, spinning, hair-raising rides on the roller-coasters. The hundred year-old merry-go-round, recently awarded the European Nostra Prize, and the two-thirds of a mile-long wooden framed switchback with nine peaks (now a listed monument) have a charming old-world atmosphere to them. There is an exhibition about the history of the Fun Fair in the departure building.